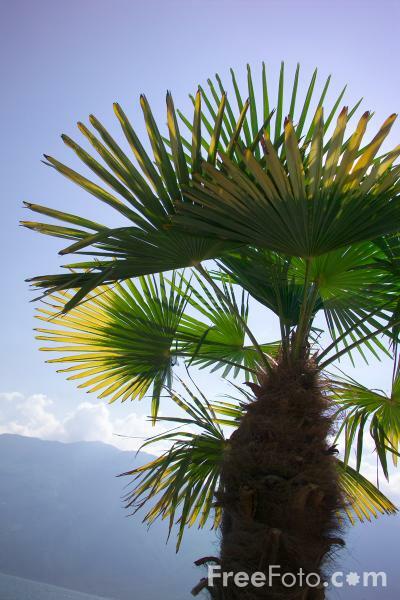 Picture of a Palm Leaf, Limone, Lake Garda, Italy - Foglia di palma, Limone sul Garda, Lago di Garda, Italia. Limone is located at the bottom of the steep Dosso di Roveri cliffs and is a small pretty village with small boutiques, touristy type shops, cafés, winebars and hotels. The name of the town comes from latin limen, that means border. VIEW: More images from the category Limone, Lake Garda, Italy - Limone sul Garda, Lago di Garda, Italia or taken at the same location or around the same time .